Without wishing to seem obsessed with either Damien Hirst, the titling of work or the programme at White Cube’s Bermondsey space, having written about Hirst’s paintings (terrible) and Nauman’s films (great) the completist in me thinks it worth writing about Hirst’s installation in 9 x 9 x 9, the final gallery space in the Bermondsey building. 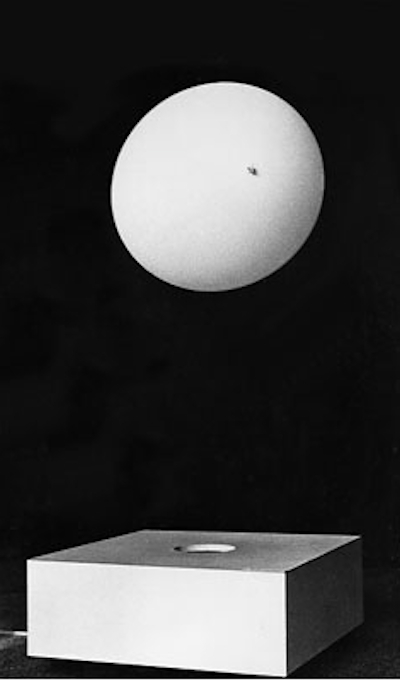 The work takes the form of two beach balls – one black, one white – floating above a black and white square basis, held aloft presumably by a fan within the base. 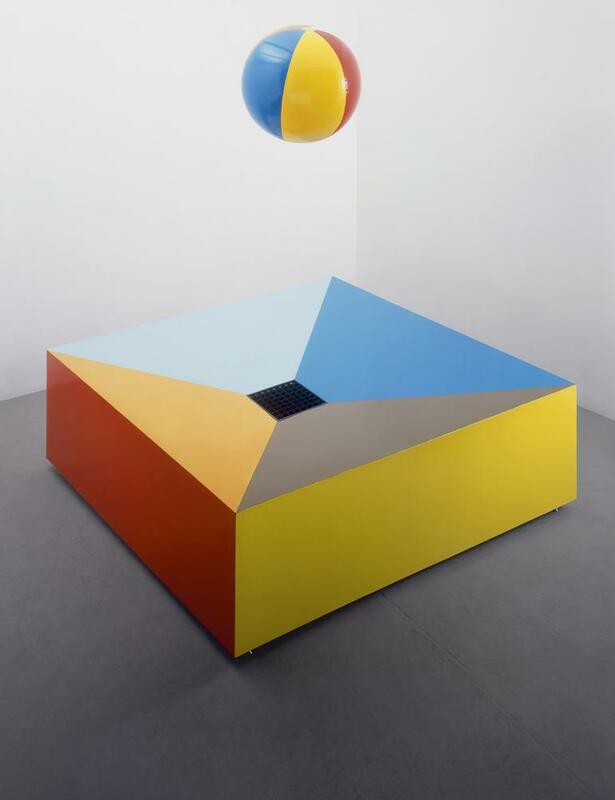 This is a playful work but my enjoyment of it was offset by wondering firstly how it would look in colours that said beach ball more assertively and secondly by wondering how it would look all in white. As it happens, on both counts, Google is my friend here. Hirst himself reinforced the playfulness of the idea with an earlier work – Loving in a World of Desire – which this one clearly references. Here the colours are those of the seaside; the beach ball looks properly beach ball like and the work stronger for it, in my view at least. But what of my other thought? the one about how the work would be as a white square within a white cube, and 9 x 9 x 9 is exactly that. Well for this, my answer comes not from Hirst but from an artist whose work I have always found rather more engaging: Hans Haacke. It turns out that more than three decades before Hirst made Loving in a World of Desire, Haacke had much the same idea. 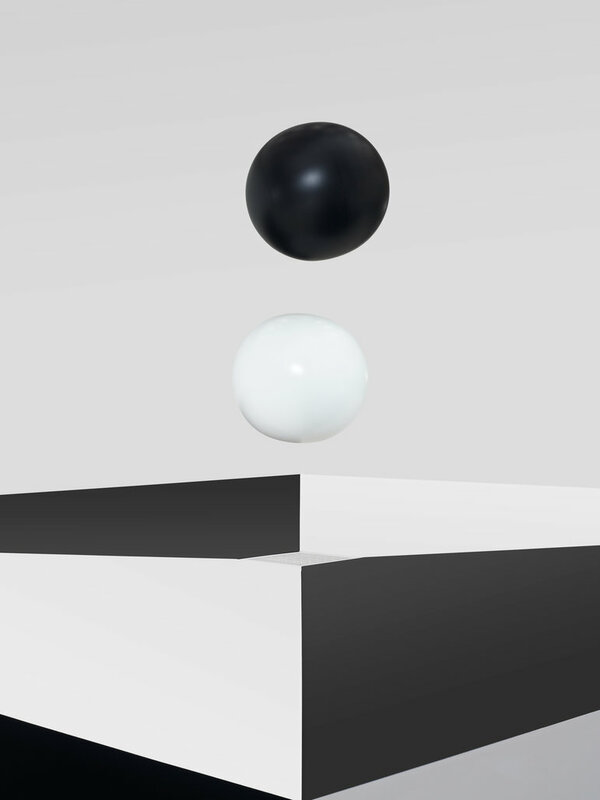 Floating Sphere is just that: a sphere floating above a square base. The work is as simple as the title is descriptive: both sphere and base are plain white. There are no tricks here and no dubious attempt at adding a layer of profundity by titling. Like Nauman’s work from a similar time, Haacke’s piece makes no big claims. It just is. The lack of colour works perfectly for me. There is no real reason for the work to be anything other than white, so Haacke has left colour out. If anyone should know how to use colour then surely artists should; knowing when to leave it out is part of that. Plus, as has probably been fairly well established by now, I’m a bit of a sucker for white works. It’s not the first example of Hirst wearing his influences a bit too prominently on his sleeve and it may not be the last but this does seem like a fairly clear case of – um, let’s be generous – homage. Ultimately though the thing that really bugged me about the black and white of Hirst’s piece wasn’t the sense that it could have been otherwise, but the cliché of the title – The Battle Between Good and Evil – which once again left me feeling that Hirst could and should be better than this. In the early vitrine works, Hirst’s titling might have been overblown at times but, even at their most excessive, the titles opened up new questions. And those questions did, genuinely, make me think. Damien Hirst: Two Weeks One Summer is at White Cube Bermondsey until 8 July 2012. 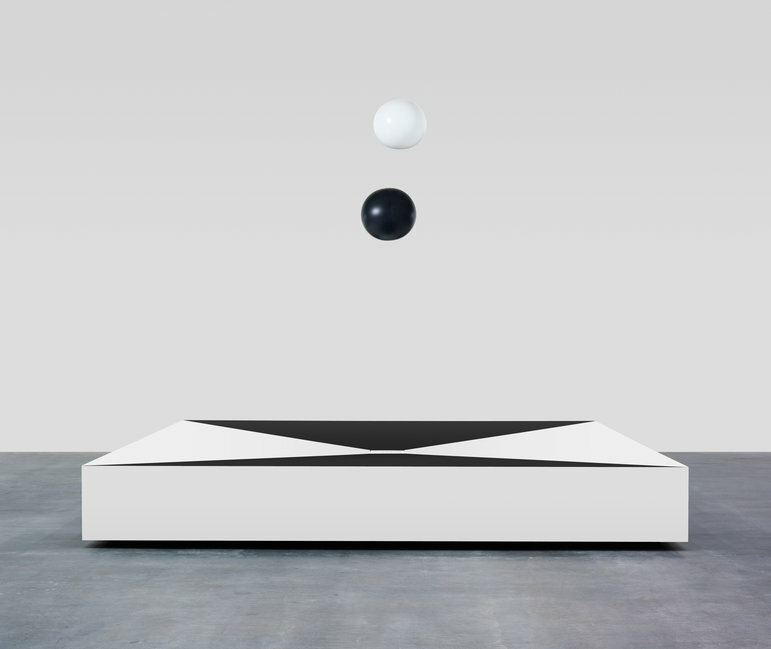 This entry was posted in Installation, Sculpture and tagged 9 x 9 x 9, art, Damien Hirst, Floating Sphere, Hans Haacke, Loving in a World of Desire, sculpture, The Battle Between Good and Evil by Ann Jones. Bookmark the permalink. PS I’m fixated on white art too (for the last 2 months). Thanks, it’s always good to know people are reading it! I’ve nominated you for the ABC Award for your Awesome Blog Content. Thank you, that’s very flattering!